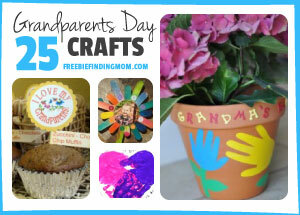 25 Grandparents Day Crafts - Nana Approved! 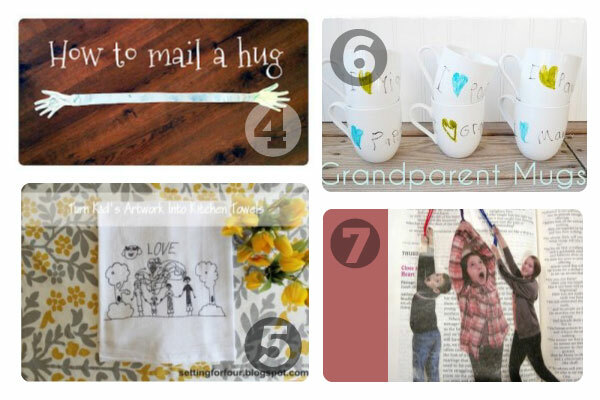 25 Grandparents Day Crafts – Nana Approved! Did you know that Grandparents Day is Sunday, September 11? 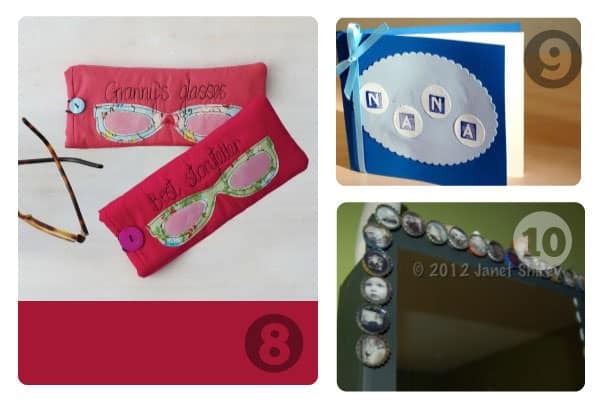 If you are looking for inspiration on gifts for grandma, grandpa or frankly anyone who would appreciate a homemade gift, here are 25 pretty impressive, unique creations. 1. Painted Popsicle Sticks Bouquet: Make Nana a beautiful Painted Popsicle Sticks Bouquet she can’t resist. 2. Handprint Tree: How impressive! It takes talent to make a DIY project not look like a DIY project. Even more amazing, the cherry blossoms were made from old clothes. 3. Watercolor Artwork: Send Grandpa and Grandma a thoughtful message using a white crayon and watercolor paint. 4. Mail a Hug: Do Grandpa and Grandma live far away? If you can’t be there in person to wrap your arms around them, do the next best thing: mail them a hug. 5. Personalized Tea Towels: Jazz up a boring kitchen towel into a work of art using your children’s drawings. 6. Personalized Grandparent Mugs: Grandpa or Grandma can have their morning coffee or tea with you everyday. 7. Awesome Bookmarks: Every time Grandpa or Grandma opens their book, they will be reminded of the goofy little people in their lives that love them so much. 8. Granny’s Glasses Case: When Grandma grabs for her glasses, she is sure to smile when she sees her custom glass case. 9. Nana Photo Book: Collect some of your favorite photos in a Nana Photo Book that she will keep forever. 10. 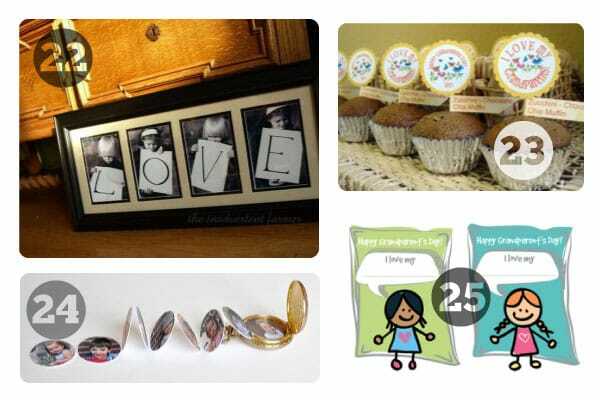 Bottle Cap Photograph Magnets: What a neat idea! Recycle bottle caps to make adorable photo magnets. 11. Footprint Butterfly: Who knew two little feet could make such a charming butterfly? 12. Personalized Flowerpot for Grandma: Grandma’s flower arrangement will surely look stunning in this personalized flowerpot. 13. 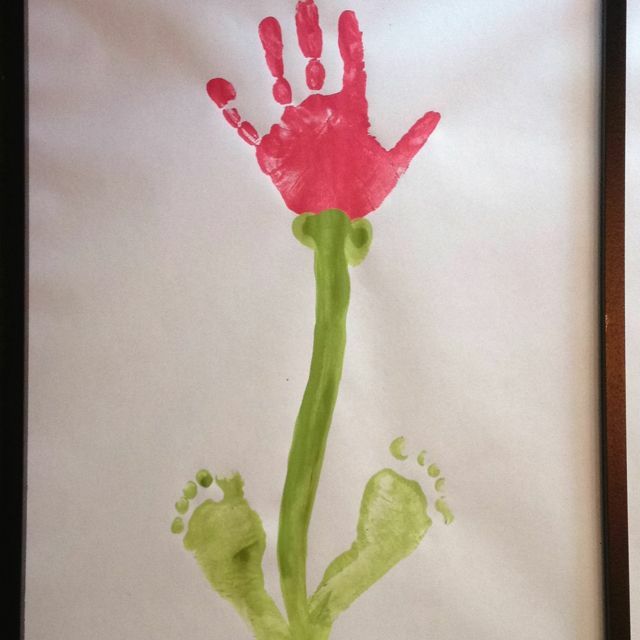 Hand and Footprint Flower: Don’t buy Grandma a flower, create one using a little hand and feet. 14. Count the Ways I Love You: Dip little hands in paint and attach this touching saying to make the perfect Grandparents Day gift. 15. Adorable Flower Pots: Holy cuteness! I love these flower arrangements! You will not find anything this adorable in the stores. 16. 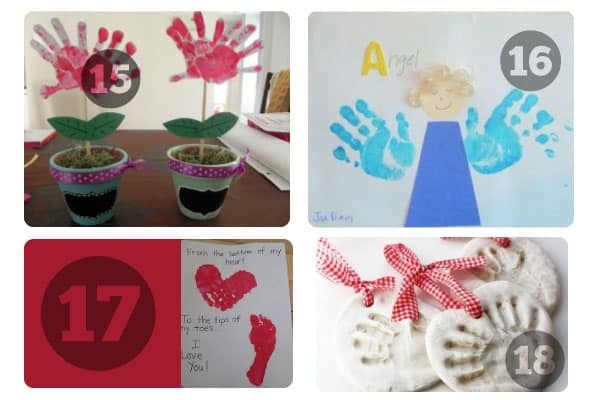 Grandpa and Grandma’s Angel: Encourage your child to make a picture of Grandpa and Grandma’s angel complete with handprint wings. 17. Super Sweet Poem: Simply put, this poem for Grandma or Grandpa is short and sweet and perfect. 18. Salt Dough Hand Prints: Here’s a great keepsake for the grandparents to remember the little hands they love so much. 19. Baby’s Own Footprint Necklace: Even the littlest grand kids can get involved in Grandparents Day gift giving. 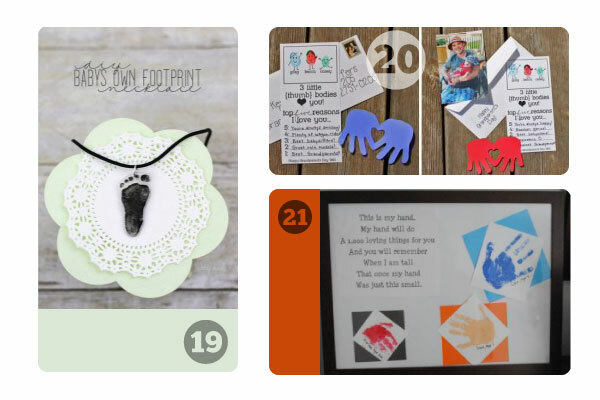 Dip little toes in paint to make a Baby’s Own Footprint Necklace. 20. Grandparents Day Thumbprint Cards: I love these cards. 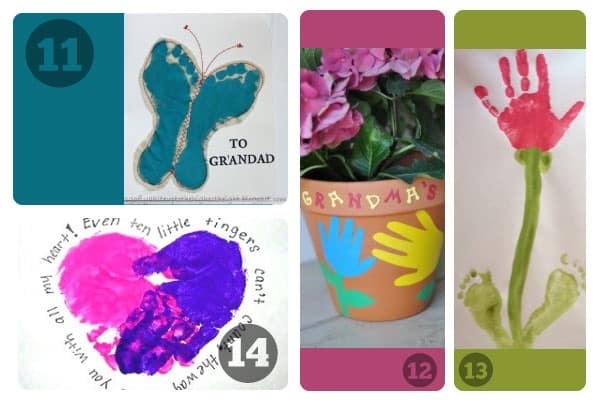 Grab a thumb and create a personalized Grandparents Day card that is sure to put a smile on Grandpa or Grandma’s face. Download these FREE printable cards over here. 21. Grandparents Day Poem: This will poem is guaranteed to be cherished for years. 22. Love Photo: Not crafty? No problem. You can still compose a super spectacular Grandparents Day gift, like this Love Photo. 23. I Love My Grandparents Muffins: If you are like me and crafting is not your specialty, and you feel more comfortable in the kitchen, then whip up Grandpa or Grandma’s favorite dessert like these zucchini chocolate chip muffins. Then finish them off with FREE printables. 24. Pocket Watch Photo Album: For the grandparent that loves to carry around pictures of the grand kids. Wait, isn’t that every grandparent? Make them a Pocket Watch Photo Album. 25. Happy Grandparents Day Printable Cards: Grandparents Day gifts do not get any easier, just print and fill out with your personal message. Then deliver with a hug. Go here to download these FREE cards. 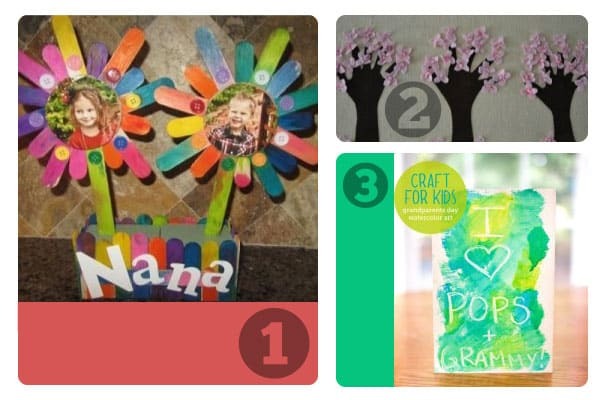 Be sure to pin to Pinterest this list of Grandparents Day Crafts and please share your favorite DIY gifts!